Saturday night was Games Night here at the Witch's Island and, by all apppearances, it was a roaring success. Our guests arrived around 4:30 which gave us all a chance to chat a bit and have a drink (okay, maybe more than one) before sitting down for dinner. 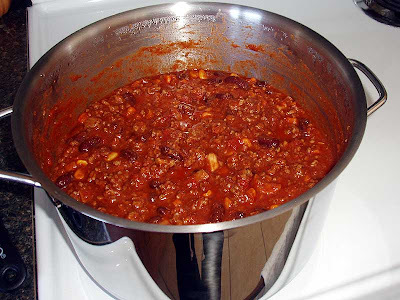 We had some Dr. Dimento's chili over rotini pasta, a nice fresh garden salad and some hot biscuits right out of the oven. Mmmm... very tasty! 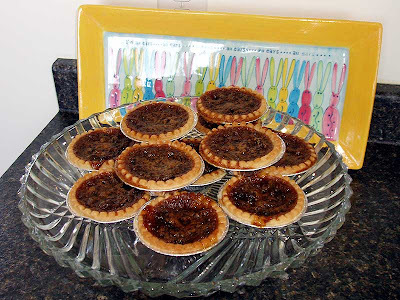 For dessert we had the butter tarts that you can see in the picture below. Then it was on to the games! Hubby and I spent some time this week trying out some of the older games just so that we would know how to play them. When was the last time you played "Clue"? I don't remember it being so complicated. Maybe it would have been better when everyone was playing but during our trial run we were playing two hands each and we never did solve the mystery. "Clue" and "Rook" were the only games that we didn't actually play last night. "Uno" was the big hit but the guys had a lot of fun playing crokinole and cribbage. The girls and I had a laugh answering a questionaire I found on Carolee's blog "Musings from Behind the Easel". I'll add my answers at the end of this post. I think we all had a fun night. The last people left somewhere close to two a.m. so today we're having a very quiet afternoon. Thankfully, house-cleaning was all done yesterday so now we can just sit back with the blinds down and a cool, damp cloth over our eyes! If I were a song I’d be uplifting. 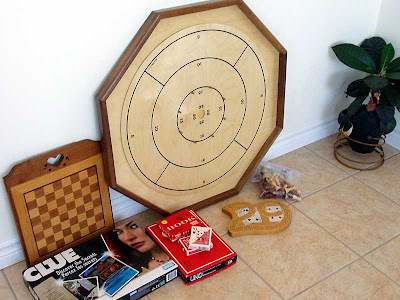 It looks like you have lots of fun on your games night! That quiz is neat, I'll have to try it too!! I've done games night twice and both times it has been fun. The first time it was a after Christmas get together were Hubby made a birdhouse cut out as a Christmas gift for my friends. The gift also included the night painting the birdhouse up and having the guys bring us drinks and food. Your game night sounds great! We used to go to a friend's house for game night...I miss that! I also want to invite you to the Friday Night confessional-check out my blog for details-see the icon at the top of my blog-right side....! I just started playing-it's fun!